Jim knows Dubuque. He has been one of Dubuque's leading real estate professionals for over thirty years. 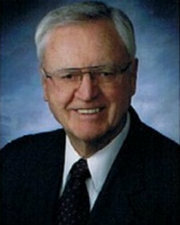 Jim co-founded American Realty of Dubuque in 1972 and is president of the company. Jim is a native Iowan and a resident of Dubuque since 1963, the year he married his wife, Monica, a native Dubuquer. They have four children, Peter, Ann, Andy, and Matt. Jim is a member of the Dubuque Chamber of Commerce, Dubuque Ambassadors, West Side Business and Professional Association, Dubuque Homebuilders, Rotary Club of Dubuque, American Legion post 528, and the Dubuque Golf & Country Club. Jim has been a real estate broker since 1967 and a member of the Multi-Million Dollar Club every year since 1970. Jim specializes in residential, income, and commercial properties in the Dubuqueland area. Jim Curoe knows Dubuque. He has been one of Dubuque's leading real estate professionals for over forty years. Jim specializes in residential, income and commercial properties. He has been a member of the Multi-Million Dollar Club every year since 1970. Jim is a native Iowan and a resident of Dubuque since 1963, the year he married his wife, Monica, a native Dubuquer. They have four children, Peter, Ann, Andy, and Matt. Jim is a member of the Dubuque Chamber of Commerce, Dubuque Ambassadors, West Side Business and Professional Association, Dubuque Homebuilders, Rotary Club of Dubuque, American Legion Post 528, and Dubuque Golf & Country Club.